My space vacant (yep - I'm behind the camera! ), Martin (back to us) running the game. For Shows North, 'Phalanx' was back to something like normal after the Games Expo (so me late after queuing on the M6 in atrociously British summer weather whilst the 'overnight' road works were still being lifted ... thanks for that, Highways Agency...).. but thankfully I'm just the stand for this one - Martin Charlesworth entertains the public ... and is local and able to hold the fort. 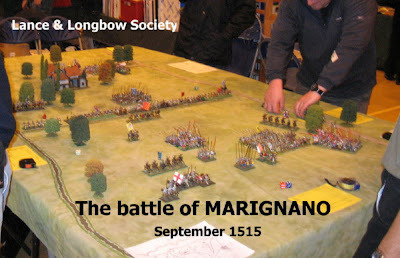 Thanks Martin - the input of local enthusiasts is brilliant and priceless for the Society. Actually, it was more frustration than disaster ... we were there by 10 ... just not in time comfortably to have the literature display up as the public were admitted. Fortunately, with the game ready and running, after ten minutes or so all was well with the world. 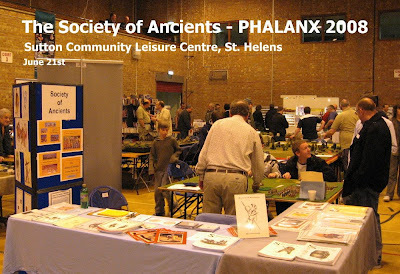 The stand was the usual Society material, but greatly enhanced by the new-look glossy Slingshot (well done Mark and Nick) and the freshly arrived Roma Invicta game (well done Phil and Nick): and thus plenty to talk about and new stuff to browse. 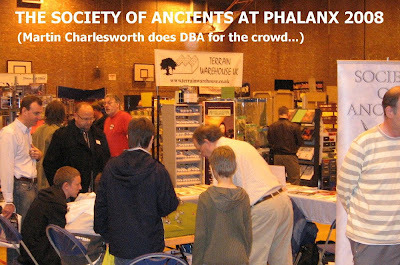 To get people thinking about Ancients, introduce youngsters and entertain vets, Martin was once again running a back-to-back DBA challenge. 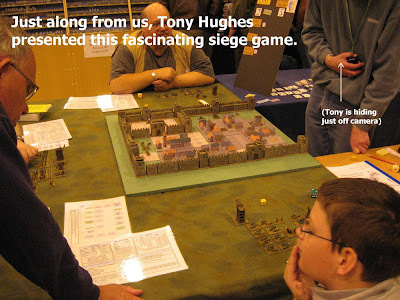 The Society of Ancients Challenge. 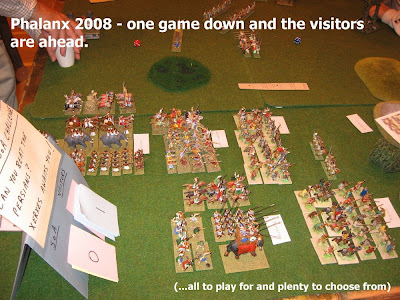 Martin takes his Persian Army ... explains his 'dirty DBA' (quick start, pick an army, lay down some terrain and keep it simple) .. you pick from a choice of challengers.. He started with a bad trot .. but pulled it round during the course of the day. In the end (and despite some sledging from me...), Martin finished 7 to 5 ahead of the game. I will post some pictures of the DBA armies when I've done a bit more editing. 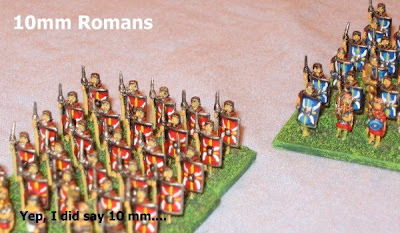 well - if we can put a 28mm Roman on the cover of Slingshot, I'm sure I'll get away with a 10mm unit on the Shows North blog! Now, I did list the attractions of St Helens earlier on in this report .. well, there's more: the Gentlemen Pensioners have a well-appointed refuge courtesy of Steve and Gwen only 20 miles or so from the show, and whose phenomenal hospitality extends to accommodation and a 'biggest game of the year' Sunday... a chance for some of us showteamers to settle down and play a wargame! 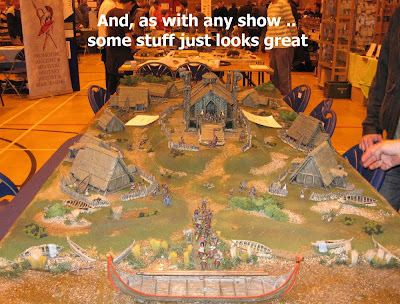 A chance for Steve to put up his 12x6 table and wallow in toy soldiers. 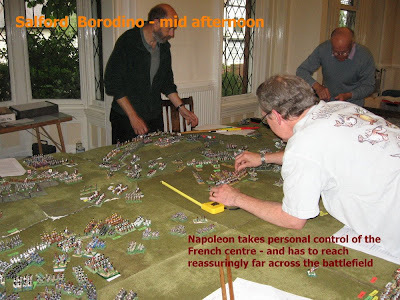 Gratuitously off topic, here is a snapshot from the 4,000 figure Shako refight of Borodino: OK, we didn't quite finish it (! ), and maybe Shako (which did work quite well) isn't quite abstract enough to handle quite the levels of forces ... but as the expression often has it .... it was fun trying! Well, that was my weekend. Thanks to everyone for putting so much into it. Same again next year? I hope so. 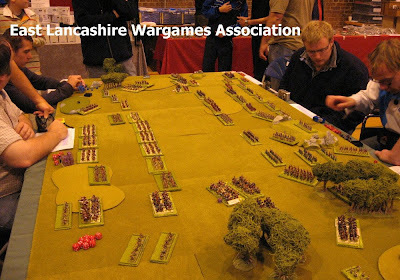 And thanks for putting on the DBA games, Martin (a collection of photos will follow shortly)..